We want to get you into the most comfortable bra you’ve ever worn. With this short quiz, we can better recommend what will work. Which bra did you purchase? 3 of 5 What size bra did you buy initially? 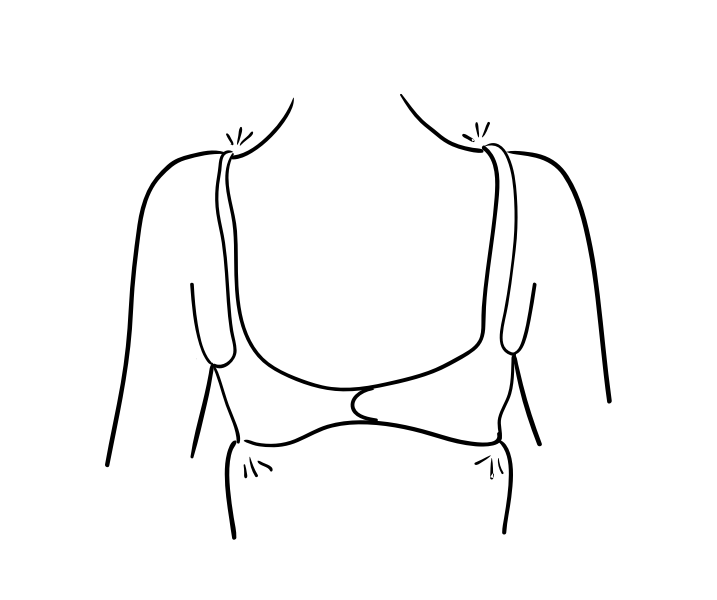 What size bra did you buy initially? How did the band fit? How did the cup fit? If your bra is fitting just a little bit snug, we offer a 30-Day Wash & Wear Guarantee so you can let the bra mold and adapt to your shape. It’s what we designed it to do. This number not sounding right? Check out our size chart for reference. It looks like you’re in the best size we can offer at this time. All of the lists. The apps! The constant reminders to SLEEP WHILE YOU CAN BECAUSE YOU'LL NEVER SLEEP AGAIN. And then there's the frantic stocking of your freezer with frozen soups because YOU'LL NEVER EAT HOMEMADE FOOD AGAIN. There's a lot of tension wrapped up in all of the pre-baby to-dos, and so much of your pregnancy and birth is out of your control. But one thing that is? The comforts of home, to the degree that you possibly can—because you may be hospitalized for longer than you anticipated (hi, Emergency C-Section) and having a bag of things that will elevate the hospital experience is something you'll be grateful for. 1. A really lovely robe. Whether you're all about that terrycloth or you prefer a slippery satin, trust me when I say that you will want to set those hospital gowns you're forced into wearing on fire. My husband bought me this one, which is made of recycled saris. The colors perked me up and the fabric was cozy and soft, with pockets and a gentle tie-waist. 2. Proper protection. Did you know you bleed after you give birth? Not for a few hours, friends. It's actually typical to bleed for up to six weeks. And everyone tells you that the mesh undies that the hospital distributes are life (which they are), but a girl can only coast for so long on lightweight, disposable fabric. Make sure you pack appropriately for this. Our new Dream Short (above!) has an extra-large gusset (think of an extra long pad) with our signature four-way stretch. The fabric is super breathable and lightweight, so you won't feel any extra pressure around your super sensitive area. 3. A lip balm that loves you. Hospitals area freakishly dry, lip balm is endlessly comforting, and these tinted ones from Caudalie can be used for a little flush of colour on your cheeks too. Because you know everyone has to come and visit and take a million photos of you in your freshly-minted state as a mama. 4. A sanitizer with style. Sure, you can find the basic-level hand sanitizer mounted on every wall of the hospital, but its jelly texture and alcohol-dense smell are so generic and unpleasant. This Germs Away Mist from Graydon Organics smells fresh, is beautiful to look at, and available in a teeny travel size (60mL). Use it to mist down the entire hospital bed and surrounding spaces (i.e. the chairs that visitors hang out in). 5. A sleeping mask in a high-quality fabric. Since you know you won't be sleeping, you should also be aware that if you happen to stay in the hospital a little longer than expected (if you have a C-section, it's standard practice to stay in the hospital for 48 hours after the surgery has ended), it's really challenging to sleep with all of the lit up beeping machines. Look for cotton, satin and linen. 6. Slippers or cozy socks. Hospital floor and germs; we needn't say more. If it's summer, you might be more comfortable with your favorite Birkenstocks or flip flops. 7. A proper pillow in a patterned pillowcase. Unless you're a minimalist, bring a bright pillowcase that won't be mistaken for hospital linen. Plus, the comfort of your own pillow is everything after the exhausting process of bringing a small human earthside. 8. Headphones. See aforementioned lights that beep. All.the.time. And crying! One of the biggest letdowns of my hospital experience was being awoken by SOMEONE ELSE'S BABY! I'm honestly still not over it. Meanwhile, my baby was sleeping like a little burrito angel. 9. A tank with a built-in bra. 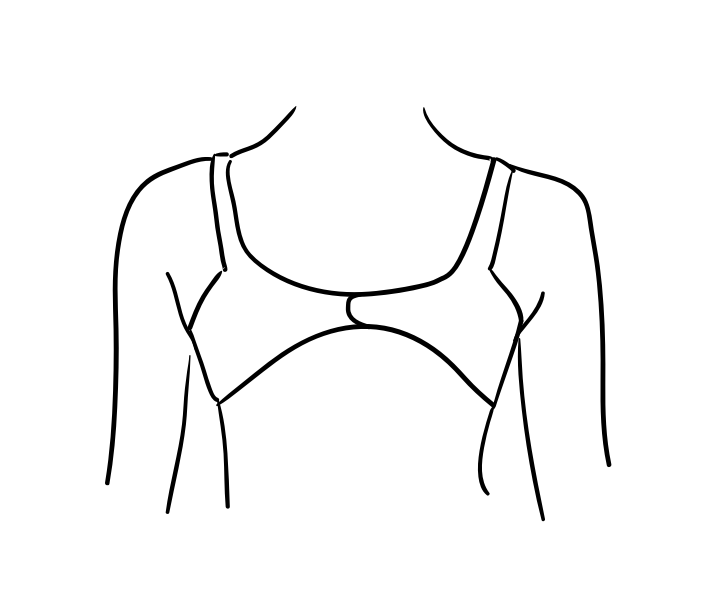 I'm sure you're long past wearing uncomfortable bras, but a tank keeps you covered, held in (your lower tummy is quite sensitive post-delivery) and your likely sensitive breasts. Even though your milk doesn't come in for three or four days post delivery, you'll want something in a lightweight, stretchy fabric, with the ease of use to nurse. All you need to do is pull the fabric down (it snaps back into place, too). Try our best-selling Evolution Tank. 10. And while you're at it, pack it all into a hard-shelled suitcase. Sure, you can use a duffel or an overnighter—but a hard-shelled mini suitcase will be easy to wheel post delivery, and keep things structured. You can use one half of the suitcase for your gear, and one half for your baby's gear. As for the baby, all you need is clothing, diapers (the hospital will toss you a few, but you're on your own for the majority) and an infant carseat. The nurse will help you adjust the seatbelt before you leave, to ensure proper placement. You're in the best size available from our Knix line. If you’d like to try a new size, return your current bra and check out Knixteen for a more petite fit. You’re in the right Knix size. Band extenders help maintain a good cup fit but add a little wiggle room to the band. Quick note: Our bras are covered by a 30-day Wash & Wear Guarantee, as they can take a few wears to relax to a comfortable fit. If yours still isn’t working, let’s get you into the right size. All Knix bras & tanks are eligible for return or exchange within 30 days of delivery. We want to make sure you can give your new top time to mold to your shape and get comfortable. Do what you want to do in it, and wash it as much as you like. If you find the fit still isn't right, message us to get a personal fit consultation before returning for the right size. Bras and clothing purchased during sale events are eligible for exchange only, and they must be exchanged during the required time frame (30 days). Underwear, bodysuits, and accessories are final sale. All of our Underwear bottoms (including Leakproof) and the Every Bodysuit are final sale and not eligible for refund or exchange. For hygenic reasons, underwear cannot be accepted. Clothing items include our T-Shirts and Lounge Collection. These items are eligible for return or exchange within 30 days of delivery. However, these items need to be unworn with the tags still attached to qualify for a refund or exchange. Is it easy to exchange items? Totally. Once you confirm your email, it’s as easy as printing your pre-paid shipping label and sending your item(s) back. How soon will I receive my store credit? As soon as our team gets your return, you’ll get your store credit or refund within 10 days. Can I return for a refund? Yes, all returnable items purchased through our website can be returned for a full refund. It will be issued to your original payment method, minus shipping costs. Can you clarify shipping costs? We’ll cover all return shipping fees. Outbound shipping from our warehouse is not covered, including exchange orders. We're here to help, send us an email at info@knixwear.com.